The last few days have been busy redrawing my original track plan from scratch. When I first started this project, I only worked with very little factual evidence. We all know Harlem Station available plans only gives a glimpse of the real thing. A few years ago, a gentleman was kind enough to contact me and provide me with better source material. Revisiting this information last weekend was like finding a gold mine. With the help of New York 1954 aerial photographs and many other pictures (which I can't unfortunately share), I was able to redraw a more realistic track plan. -Track plan will be faithful to prototype as much as commercial turnouts permit. In fact, I can know announces it is almost a perfect fit. -When time and money is available, locomotives will be radio-controlled/battery powered and sound equipped. With going with battery power? Because Harlem Station is a maze of turnout and use very short locomotives (Alco S1 is the largest thing that will be used). From experience, I know this can lead to very frustrating operations at slow speed. Battery is the only viable option to operate this kind of layout without a glitch. Also,wiring this can of module can quickly become a living hell. The layout will be built in two modules for easy transportation. All structures will be removable, including car float apron. 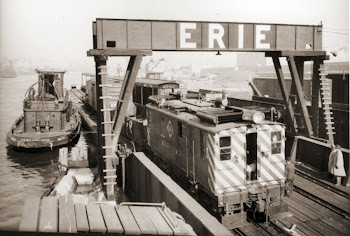 I didn't set the era in stone, but I feel circa 1957 (before the freight station was substantially enlarged) is a safe bet. I'm still wondering if I'll build the long shed. Well, that's about the main choices about this project. I'll probably use this layout as an excuse to push my skills to their limit.